PaperMaster cabinets can be exported into regular Windows folders. Exporting a cabinet lets you still access all of your PaperMaster files in the same drawer/folder hierarchy you used in PaperMaster. You'll see Windows folders for each of the PaperMaster drawers that you export, and inside you'll find that all of the exported PaperMaster folders, with the same names you used in PaperMaster. The PaperMaster Export Utility is an easy way to export your PaperMaster cabinets and access your PaperMaster files outside of PaperMaster. Exporting a cabinet from PaperMaster will also export all of the files in the cabinet. The PaperMaster Export Utility finds all of the files in your PaperMaster cabinets and copies them into a new cabinet under exactly the same drawer and folder names as the PaperMaster cabinet. When you export your PaperMaster cabinets using the PaperMaster Export Utility, you don't normally need to convert your PaperMaster files as long as they're in a usable format. 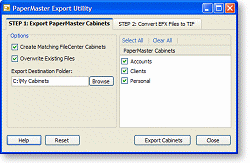 PaperMaster cabinets hold many file types and most don't need to be converted, just exported from the PaperMaster cabinet so you can access them outside of PaperMaster. The PaperMaster Export Utility will export all of your PaperMaster files from your PaperMaster cabinets, keeping the original names you used in PaperMaster. The one file type you may want to convert when you export from PaperMaster is a PaperMaster EFX file. The PaperMaster Export Utility can try to convert your EFX files when you export them. The biggest challenge with leaving PaperMaster is converting PaperMaster's proprietary EFX files to a more open format. If your system supports it, the PaperMaster Export Utility can convert PaperMaster EFX files to PDF – a format that's universally supported. Converting PaperMaster EFX files is an optional step after you export your PaperMaster cabinets, but one that can ensure you still have access to documents you scanned into PaperMaster. With Windows Vista and Windows 7, PaperMaster users have found that they no longer have access to their PaperMaster files. As PaperMaster is no longer being developed, PaperMaster users have no way to access their PaperMaster cabinets and PaperMaster files if they switch to Vista or Windows 7. The only solution to accessing PaperMaster files in Vista and Windows 7 is to export and convert your PaperMaster files and PaperMaster cabinets and find a PaperMaster replacement. The PaperMaster Export Tool is helping many former PaperMaster users upgrade to Vista and Windows 7 without losing their PaperMaster data.